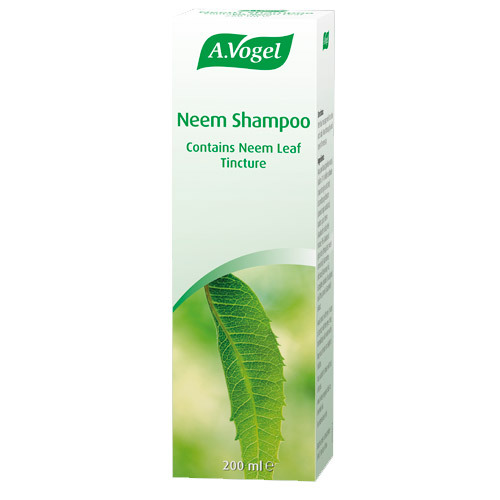 A Vogel Neem Shampoo for the whole family contains neem leaf tincture to help soothe dry, irritated and flaky scalps. Does not interfere with dyes or other hair treatments. All parts of the Neem tree have a long history of use in Indian culture. As an important part of traditional Ayurvedic medicine. For centuries it has been used for a wide variety of conditions ranging from pest control, to a sedative and as a contraceptive! Today, the main use of neem extracts is as an insect repellent and in body-care products such as A Vogel`s Neem shampoo. Aqua purificata (purified water), Sodium C14-16 olefin sulfonate (coconut origin surfactant), Cocamidopropyl betaine (coconut origin surfactant), Sodium chloride (salt), Citric acid 50%, PEG-60 almond glycerides (ehtoxylated sweet almond oil), Neem (Azadirachta indica) leaf tincture, Rosmarinus officinalis (Rosemary) oil, Eucalyptus globulus (Eucalyptus) oil. Below are reviews of A Vogel Neem Shampoo - Neem Leaf Tincture - 200ml by bodykind customers. If you have tried this product we'd love to hear what you think so please leave a review. Lovely natural product that smells great, but unfortunately didn't work for me to relieve my scalp of flakes and itchiness. 4 stars given for the product ingredients, but I've had to purchase an alternative product to help me with my scalp problem. Brilliant has been really beneficial for my hair. This shampoo has worked wonders on my dandruff. I no longer have an itchy, flaky scalp. Also, a little goes a long way, making it more economical. All my family now use it!